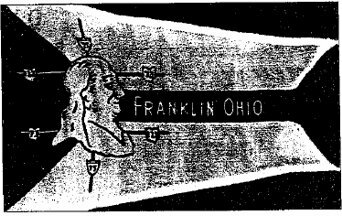 The flag of the City of Franklin, Ohio, is of Ohio format, consisting of triangle on the hoist and three horizontal fields on the rest of the flag. On the center is positioned a head of Franklin facing right, and around it 6 road markers, signifying 6 major roads coming to the city. Colors are unknown. "Councilman Joe Baxter suggested in 1969 that Franklin should have a flag, and suggested a contest to determinate its design. There were 185 entries, but the winning design was the one submitted by Mr. Baxter. In 1973 the first flag was made by Jean McGill. The flag was presented on December 17, 1973 at Mr. Baxter's last council meeting. Mrs. McGill was given a watch in appreciation. The original flag was about 4x6 feet, but for the 1976 Bicentennial, small silk flags were made commercially and many were sold in sets of three - United States, Ohio and Franklin." Image (very poor black and white) and information thanks to James Lukas, Franklin City Manager.